Depending on which part of the world you are at, the impact could be felt in one way or another. Yes, the FIFA World Cup 2010 has started in South Africa. In countries where some of the matches are shown live during early mornings, it would not be any surprise if some would turn up at their offices sleepy and tired. 24 teams representing the world's best are fighting for the ultimate glory, to be crowned as the Champion of this 19th edition. Given how globalised the world is now, this event is being watched by millions of people all over the world. Those with passion and financial ability are now in South Africa, providing teams which they support with whatever encouragement they could. Is has been a gigantic task for South Africa, the host, to organise this kind of event. Although there were challenges and problems at certain stage, especially when the world was experiencing the worst financial crisis ever, the stage was open for competition as scheduled with a memorable opening ceremony. For statesman Nelson Mandela, this event would be the icing on the cake, the ultimate sign of his achievement in consolidating South Africa into a state belonging to all South Africans, whatever colour they are. It is unfortunate that Mandela is in mourning due to the demise of his grand daughter who died on the eve of the first kick off. We are now at the early stage of the tournament. No doubt history will be created, future will be charted and many hearts will be broken. This greatest show on earth is more than just a sporting event. 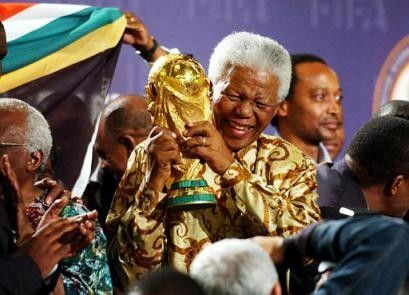 It means a lot the the poor most African countries, finally this great soccer event has reached their shores. Hopefully, more people would be enlightened and inspired, not just to play better soccer but to take up the challenges of their lives.